Tom Milner, one of the four regular drivers in the Multimatic Motorsports Team Panoz squad, joins Scott Maxwell and Gunnar Jeannette aboard the #50 Panoz Esperante for this year’s Le Mans 24 Hours. It will be Tom Milner’s debut at Le Mans. Both Scott Maxwell and Gunnar Jeannette first appeared at Le Mans in 2000, Maxwell then, as now, driving for Multimatic – in the team’s LMP 675 winner. Jeannette was the youngest ever finisher (and starter!) 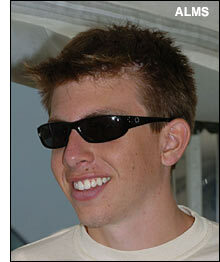 at Le Mans in 2000, aged 18. "Obviously we didn't have the result we were looking for at Mid Ohio, but I still finished the event with a smile on my face after being told that I would drive for the team at Le Mans," comments Tom Milner. "For a lot of young drivers in the US, they grow up dreaming about the Indy 500, but I was raised around sports cars and have always looked to Le Mans as my #1 event. "It is definitely an honor for me to be invited to drive at the race, especially with a team like Multimatic, because they have so much great experience there. "This year I have been able to learn a great deal from my team-mates and I will certainly be picking their brains a lot in the lead-up to the race. I have already clocked up a couple of hundred laps on video games around the Le Mans circuit and I certainly will be doing a lot more in the next couple of weeks. Larry Holt has quickly become an admirer of his new, young driver. "Of our guys, Tom has the least experience but his efforts, both in and out of the car this year have really impressed me. He has done more than enough to prove he is certainly worthy of his spot at Le Mans alongside Scotty and Gunnar. "We are disappointed for both him and Gunnar that we have not been able to provide him with more reliable machinery to date to get the job done in the races, but we believe we have found the problem that has plagued them in the past two weekends. "We will be using the #50 car at Le Mans which, to date, has run almost faultlessly in 2006. The entire team is in a very confident frame of mind headed to France." The #50 Panoz completed the recent Mid-Ohio ALMS race in a very competitive second place – and as in recent years, the GT2 Class should see the ALMS teams racing at the front, for the class win. The #50 Le Mans entry will feature the return of the BBS Wheels logo to the side of the Panoz Esperante GTLM. Multimatic Motorsports Team Panoz has signed a new deal with BBS, continuing the long-standing technical partnership between Multimatic, Panoz and the German wheel manufacturer. 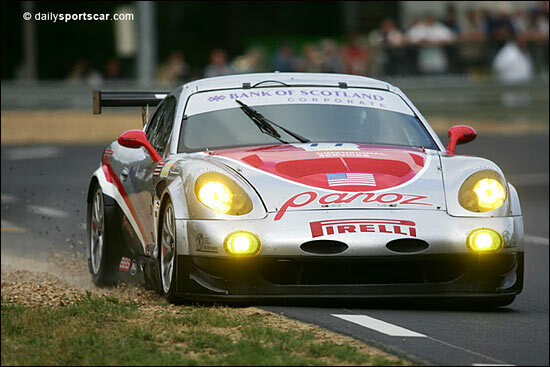 The Team LNT Panoz forms the second part of the ‘American’ attack on the GT2 Class – although this team is very much a British one. Here's the #77 car on a hot qualifying lap at Le Mans last year.